Mathematics lessons consist of three one hour lessons per week. Students in each Year Group are currently split into two groups based on ability. Performance is reviewed half-termly and students are moved between sets if it is appropriate. Similar schemes of work are followed by both sets to ensure that any change of set for a student is as smooth as possible. The schemes of work follow national guidelines and are structured so that each term is taught as a distinct unit to ensure that the whole curriculum, for each of the areas of Number, Algebra, Shape and Space and Data Handling, is fully covered. Due to the increased demand of the new GCSE course Year 9 begin coverage of the GCSE syllabus as part of a 3 year preparation. Set A are prepared for entry to the Higher level tier and Set B for the Foundation level. However, movement between the sets is still considered each half term. Seven one hour lessons per fortnight are delivered in Years 10 and 11. All students cover the necessary syllabus for entry to GCSE examinations via the Edexcel examination board. Normally students are placed into one of three sets. 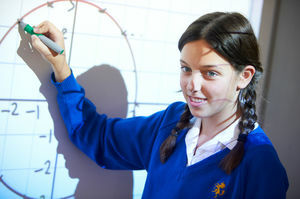 The top set will sit Higher level GCSE Mathematics and target levels 7-9. The second set may also sit the Higher level GCSE at the end of Year 11 but are being targeted to achieve levels 5-7. The third set will sit the Foundation GCSE at the end of Year 11 and are targeted to achieve levels 3-5. Mathematics seeks an understanding of patterns and structures, demanding the application of logic, creativity and rigour. Mathematics is therefore both an Arts and a Science discipline: both a system of skills used to perform calculations, devise proofs etc. and a system of knowledge relating to number, shape and abstract concepts. You must study Mathematics if you wish to study Further Mathematics as it is a continuation of the A Level Mathematics course in which you will study new topics / modules and previous topics to a greater depth.